A Gokwe man who was murdered by alleged Zanu PF activists two years ago is “refusing to be buried” amid mysterious circumstances. The body of Moses Chokuda is still in Gokwe Hospital mortuary and his father, Tawengwa Chokuda, told NewsDay that his son was “fighting his own war”. Chokuda’s father chronicled events that led to his son’s death at the hands of alleged Zanu PF supporters whose names he claimed were Farai Machaya — whom he said was the son of the Midlands governor Jason Machaya — and Edmore Gana, son of the Zanu PF district coordinating committee chairperson for Gokwe, Isaac Gana. He said although it was almost two years since his death, his son’s corpse still appeared fresh. He said he wanted 15 cattle as compensation before he could bury his son. “The way he was killed was ruthless. He was beaten to death, tied with ropes and dragged like an animal. I think he is now fighting his own war,” he said. Chokuda said police had tried to bury his son by force after he had refused to participate in the process but they failed to move the coffin out of the mortuary. Police spokesperson Wayne Bvudzijena said the police were aware of the case but it was not their responsibility to bury people. Chokuda said he was told by mortuary attendants at the hospital that sometimes they saw his son sitting on top of his metal coffin. Recently, said Chokuda, his son’s corpse was said to have spoken to mortuary attendants who had brought the body of a victim of violence, advising them of the right place to put such bodies. 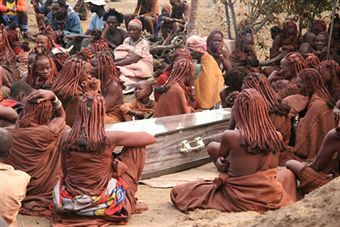 People in Gokwe who spoke to NewsDay last weekend corroborated Chokuda’s story saying countless efforts to have the deceased buried had failed due to various inexplicable occurrences. They said a magistrate who had granted the accused persons bail when they first appeared in court had been affected by a mysterious mental affliction and is roaming the streets of Gokwe. “The coffin did not move out when about 10 police officers tried to lift it out of the mortuary to bury him against my will and without my consent,” Chokuda said. “My son is seen alive by those who are linked to his death,” he said.“I hear he (the dead man) is herding cattle belonging to one of the suspects at a farm,” said Chokuda. Chokuda said he expected the people responsible for his son’s death to come forward and apologise with at least 15 cattle as compensation so that his son could rest. “Don’t forget you cannot stop an avenging spirit by going to jail or through the courts. Even if you die, the rest of your family that remains behind will suffer from that avenging spirit,” he said. The late Chokuda’s mother, Gertrude, who is blind, said she was angry and would remain burdened until the day her son “comes home to rest”. “I am blind and it is painful to have a dead body in my house. It’s very painful. I thought I had found an eye but ZanuPF did this to my son,” he said. Innocent Zimbabweans need help, their entire country has been decimated and they are suffering while you stand by and simply enjoy. They do not need sick racist spectators. You truly do not deserve to walk amongst the dignified people of Zimbabwe. You should be ashamed at taking pleasure in this and I hope God shows you the error in what you are doing. This is nothing but the work of the devil you are heavily involved in. I am deeply saddened by this situation and sad that this is your life. Please turn from this path of death and seek Christ where you will find peace and life. Please stop finding perverse pleasure in others horrific suffering. Is your heart truly that hardened? Have you no mercy at all? i dont understand what u r trying to say who is enjoying what?? Does the father controlling that 'avenging spirit'? MY PEOPLE PERISH BECAUSE OF LACK OF KNOWLEDGE- HOSEA 4:6. THESE SIGHTS SHOW THE DARKNESS THAT IS PERVADING ZIMBABWE WHEN CHRISTIANS REMAIN SELF CENTERED IN THEIR MOTIVATIONAL AND NOT SALVATION CHURCHES. THE PATHETICNESS OF THE STATEMENT THAT PEOPLE ARE ENJOYING THIS, IS BORN OUT OF THE ZIMBABWE MENTALITY WHERE BURYING ONE'S HEAD IN THE SAND HAS BECOME A DEFENCE MECHANISM AGAINST THE HARSH REALITY OF OUR DEGENARATING NATION. THE TRUTH WETHER SENSATIONAL NEEDS TO BE SHOWN. SEARCH THE WILL OF GOD BEFORE PREACHING JUDGEMENTALISM. GROW UP, FACE REALITY AND FIGHT THESE ATROCITIES WITH SOME OF US CONCERNED CHRISTIANS.